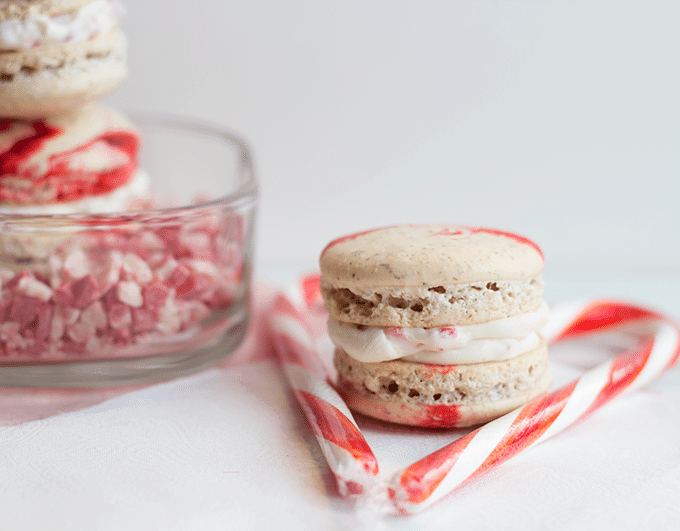 This month’s theme for the creative cookie exchange is peppermint. I love peppermint, but it’s not one of my go-to flavors. However, my son has quickly become a peppermint lover. Every time we go to the store we have to pick up a York peppermint patty. It’s ridiculous. If he sees the king size York patty package, he’ll get that instead of the normal sized patty. Smart boy. 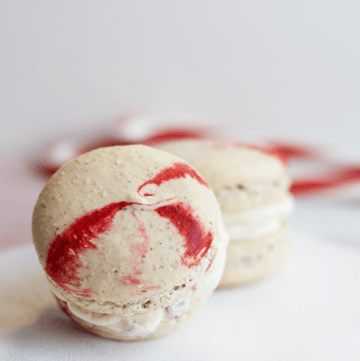 So, this month, I put together a peppermint macaron with a white chocolate ganache loaded with peppermint bits from Andes. If you’re thinking that this cookie has got to be overloaded with peppermint, let me just say that the white chocolate ganache mellows out the peppermint. I absolutely love these. So much so, that I’ve ate far too many while trying to get my pictures edited. On the left is the Andes peppermint crunch that I used in my ganache. It really adds the slightest crunch to the ganache. It’s a wonderful mouth feel, in my opinion. If you’ve noticed the little flecks of brown in my macarons, I did not use the blanched almonds to make my almond meal/flour. My almonds were thinly sliced and had the brown skins on the sides. If you want a pure white macaron, look for the blanched almonds. I really didn’t make a template on my parchment paper as I was piping out the cookies. They aren’t the same consistent size, but they all manage to have the perfect fitting match. I’m not crazy about making excessive work for myself. I have enough of that with a two and a half year old, but by all means if you are a perfectionist just make a template with the perfect size circle on the parchment paper and flip it over so the pencil/pen doesn’t get into the macarons. I feel seriously crafty that I was able to incorporate a heart into my pictures. I know it’s not anything that someone else hasn’t done, but go me! Yes, I will sometimes toot my own horn. Prepare a baking sheet by lining it with parchment paper. If you choose to make a template to follow, make for rows of four circles with a pencil. Flip the parchment paper over so the pencil doesn't get into the food. Add in the granulated sugar, salt, and cream of tartar. Mix on high until a stiff peak meringue forms. Very lightly and carefully fold in a third of the almond flour/powdered sugar into the meringue with a spatula. All together you'll want to have about 65-75 turns of this mixture including turning in the peppermint. If you don't mix enough the macaron shell will be extremely fluffy and cracked. If you overmix, the macaron shell will be extremely flat and might not form a foot. Repeat with the rest of the almond flour/powdered sugar mixture. 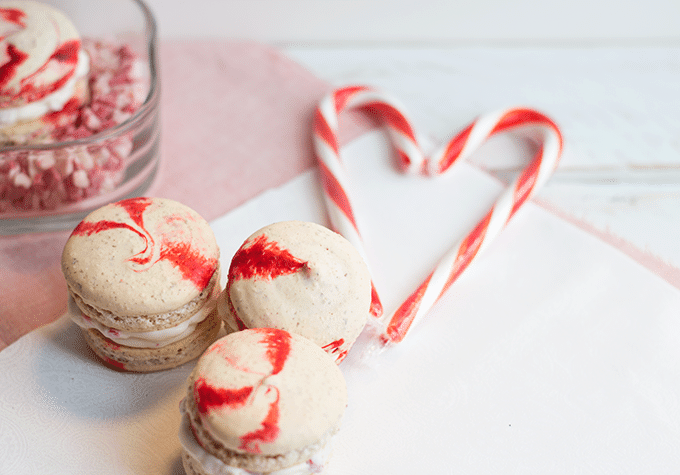 Fill a piping bag with the macaron filling. I just used a coupler on the end of my piping bag. Pipe macaron shells on the baking sheet. Place in the oven for about 18 minutes until they no longer stick to the parchment paper. In a small bowl, add in the white chocolate chips. In a large measuring up, measure out 1/3 cup of heavy cream. Heat in the microwave for 1 minute. Pour over top of the white chocolate chips and let it sit for a minute. Whisk the cream and chips together until combined. 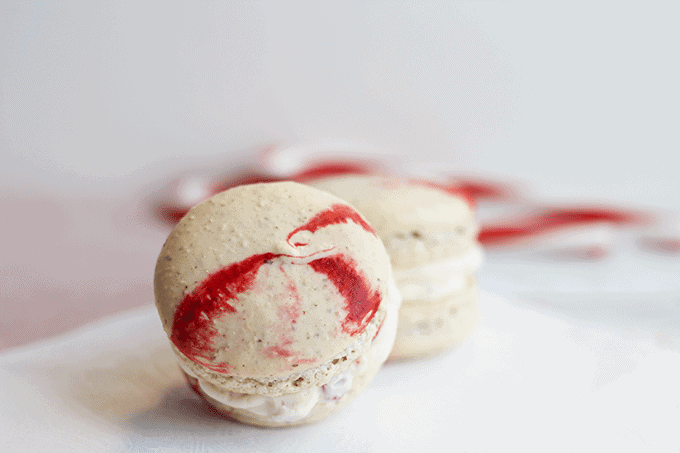 Let the ganache sit for about five minutes before adding the Andes Peppermint Crunch so it doesn't melt it. Fill a piping bag with the cooled ganache. Don't use a tip otherwise the peppermint crunch will be stuck in the tip. Fill the cooled macaron shells with ganache. I stored my cookies in the fridge because of the heavy cream in the ganache. 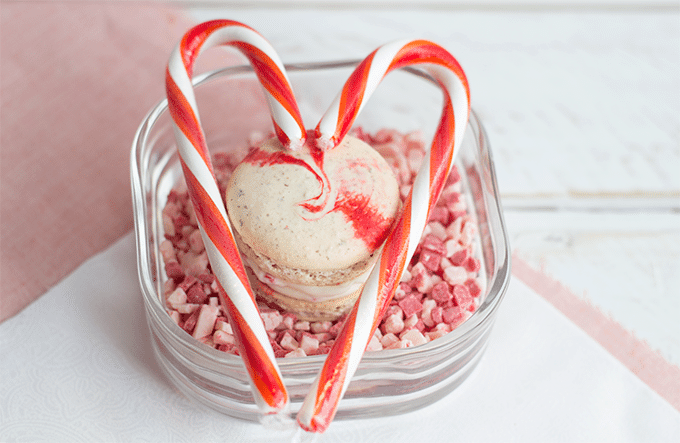 The macaron shell recipe was adapted from Delightfully Tacky. Thank you! I get so discouraged if they don’t turn out right. 😛 Absolutely gorgeous, Miranda. Your macarons have perfect feet. 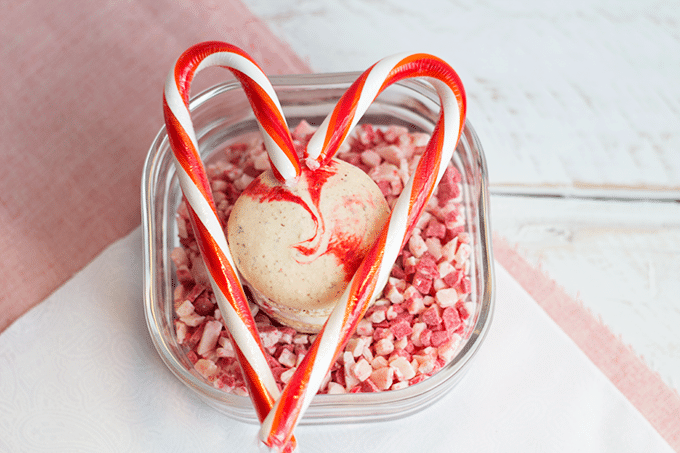 Quite ingenious of you to balance the sweet white chocolate with the bite of peppermint. Bravo! lol I can feel my ego growing. Thanks! They look so good, they one cookie that I can’t make, I have tried and tried. I might have to try yours. Gorgeous! I have been wanting to make macarons this season and haven’t gotten to it yet. Yours are so pretty! Nice job! 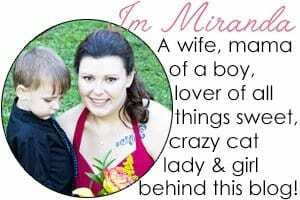 Your macarons are just perfect, Miranda! I love the swirl of red in the white. And that ganache filling with Andres peppermint crunch? I am in love! Wow, your cookies are perfection! I love everything about them and the photos are beautiful. The heart is so cute, and if it has been done before I don’t remember it because I just have your photo in my mind now. Wow. Impressive. So gorgeous. The stripes on the macarons are a work of art. Thank you! They were soooo good! These look beautiful and delicious! How/what step did you do to incorporate the red swirls on the shell? Thanks! Thank you Catherine! I used red gel paste color which is thicker than regular food color and striped the piping bag I was going to use to pipe the macarons. I then put the macaron batter into the bag and the red striping in the piping bag did the rest for me! I tried this recipe and I can’t get my shells to form. The best description I can give you of the way they look is melted snowmen! I followed the directions to a T. Help please! I sent you an e-mail. Make sure you use gel paste color and not regular liquid food coloring to stripe the bags. It sounds like you overmixed the egg whites and almond flour. Macarons can be finicky.